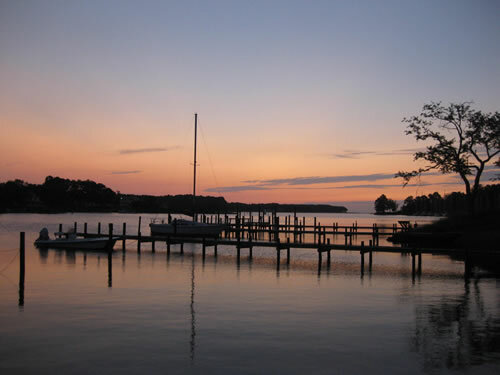 On the Chesapeake Bay, we felt the earthquake, yes, but were already focusing more on Hurricane Irene. By Thursday we felt we'd better head inland, stop in Richmond to check on any mid-century house earthquake damage (one picture fell off a wall, that was it) and gather anything else we needed (I had packed for the Chesapeake Bay *and* Appomattox this weekend, in the case Hurricane Irene became a quick Category 4). We repacked the car slightly, loaded in the children and dawgs back in and hightailed it to the off grid prefab SIP house at, appropriately named: Higher Ground. Just in time to experience an ominous thunderstorm with... slowly... twisting... clouds. 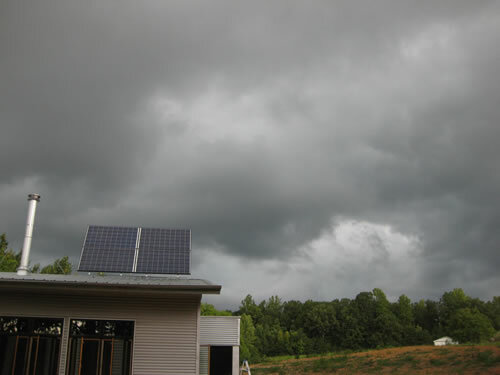 We unpacked: "Y'all watch those clouds, childrenz; if you see a funnel let me know!" Sheesh. 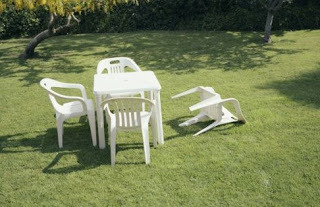 JUST WHAT I NEED, a possible twister comin' across the field after all this?!? 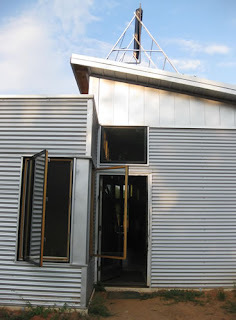 The passive solar prefab again showed how strong and solid and steady she is. When I talk about using a marine approach to small footprint living, it is more than that - our passive solar, energy efficient, prefab made with sturdy SIP is both our port, our vessel, our safe harbor, our boat. We continued to ready for the hurricane. Handsome Husband finished burying the cistern. 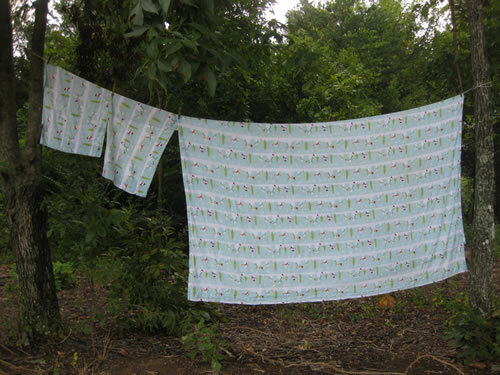 We did laundry, so we'd have plenty of clean sheets for guests. We pulled the second bunk bed frame out of the shed to put together for the middle bedroom and carefully planned so that TEN people could all sleep in real beds before we even had to pull out an air mattress! And we have two double mattresses, ready to pump up! While at the Bay, I made big amounts of food to bring to the prefab so we'd already have some things ready. Come out! Come out! We even emptied the composting toilet. And then? I tried for *days* to get our Virginia Beach, Chesapeake Bay, and Richmond friends and family to come. It's like... no one took Irene seriously, or thought she would really be that big. By Friday I was *begging. * They began to evacuate New York City (note: days in advance vs. anything Virginia was doing), and I told my New York City friends and family to catch the train to Lynchburg and I'd pick them up at the station. "We could always buy more air mattresses and supplies in Appomattox, just please do come!" "With an estimated 55 million people in the path of a storm the size of California, the East Coast’s major cities were preparing for the worst. 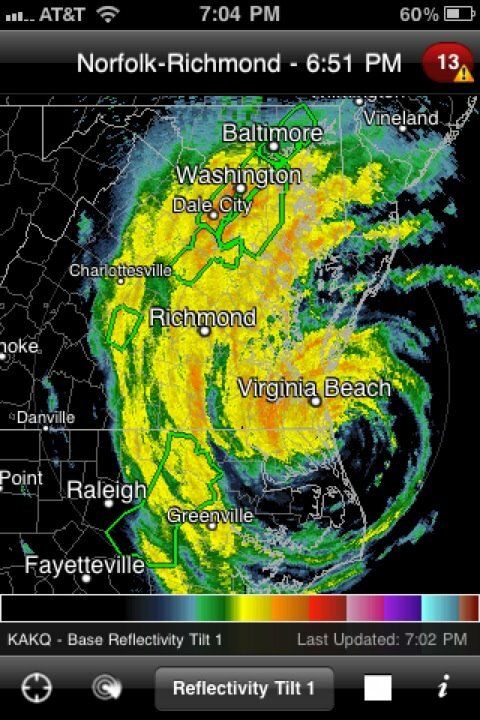 Hurricane watches were posted and states of emergency declared for North Carolina, Virginia, Maryland, Delaware, Pennsylvania, New Jersey, New York and New England. Amtrak canceled train service for the weekend, and airlines began canceling flights, urging travelers to stay home. For the first time in its history, New York City planned to shut down its entire mass transit and subway system — the world’s largest — beginning at noon on Saturday. At least 370,000 people in the city were ordered evacuated from low-lying areas. New Jersey Transit was set to suspend service then as well." “'All of us have to take this storm seriously,' said President Obama, who cut short his family vacation on Martha’s Vineyard, Mass., to head back to Washington on Friday. 'All indications,' he said, 'point to this being a historic hurricane.'" I have never been more miserable in my life. The winds whip here and I can see, via the internet, what it's doing to the shore. We have a 93 year old family friend who lives a block from the oceanfront in Virginia Beach who refused to be picked up. 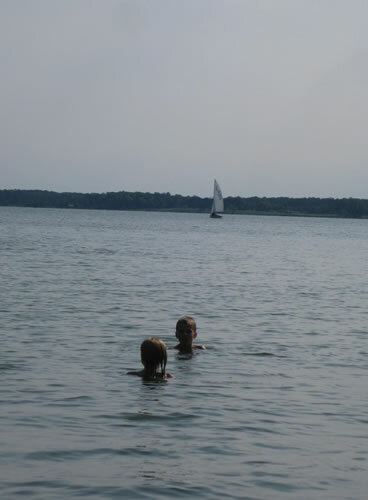 Our dear friends and family are in Deltaville - some family even on boats. And my parents, sister & her family, and most of our friends are in Richmond. There is nothing more we can do but wait it out and hope everyone is ok.
Saturday dawned and a steady gusty wind blew. By eight, the rain began. 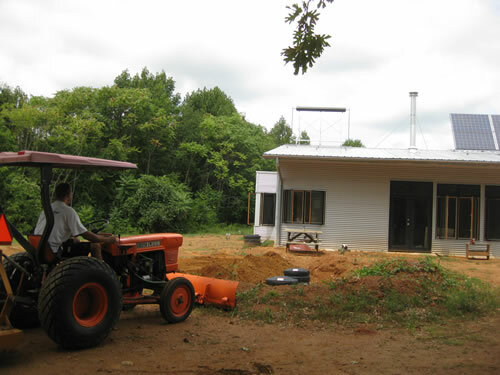 The grading done around the prefab home is working *great. * It is carefully channeling the water far away from the house kit and gently down the hill, avoiding the "future natural pool" to wind its way to the Future Orchard. 2 Million already without power. 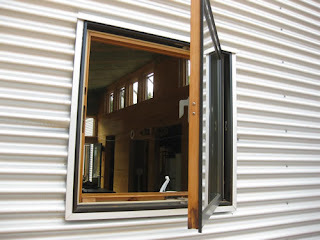 By 5pm after a day of torrential rain and wind, there is not a leak, a breeze, nothing within the prefab home but cozy, strong comfort while we watch the trees wave and bend and listen to the rain hit the roof, steady, driving, yet... somehow pleasant. 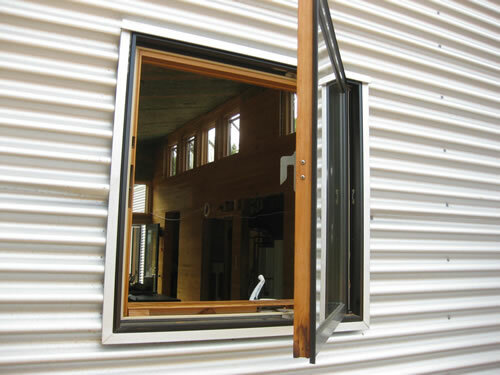 It reminds me of when we did the energy audit / blower door tests on the energy efficient SIP house; except it's OUTSIDE that's a-blowin', at hurricane levels. Inside the prefab? 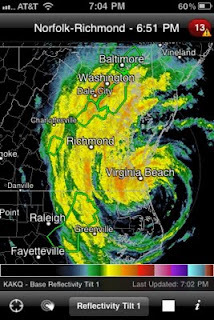 Hurricane Irene just touched land today in the U.S., but people have already died, many of those, preventable. I would like to take a moment to give a shout out to WxRisk.com. Thanks to the information and discussions on David's WxRisk facebook page, I was able to look at data, evaluate data, put opinions and interpretations together to form my own judgments DAYS in advance. I am put out with local Virginia weathermen to whom everyone I pleaded to evacuate listened: "Slight chance of rain..." I tried to convince loved ones to come here but when their tv is telling them it's a 30% chance of rain, as I am trying to get them prepared, begging them, warning them, to leave: Their tv says otherwise, until suddenly their trusted tv changes course at the last second, too late...?!? "We have no power, your Sister has no power, are y'all ok?!?" For all of our New York friends and family, stay safe... she's heading your way. Y'all may have heard we just had an earthquake in Richmond. We're fine. I was in the midst of my Hurricane Party Preparation when the earthquake struck. Happy again at Higher Ground. 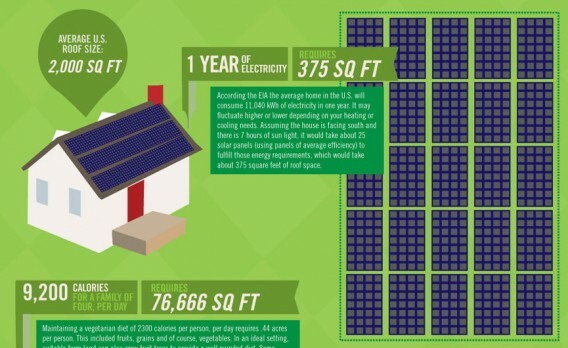 Just out at Jetson Green, check out some great graphics for how much solar (and land) you might need if you would like your prefab home to be securely off grid. 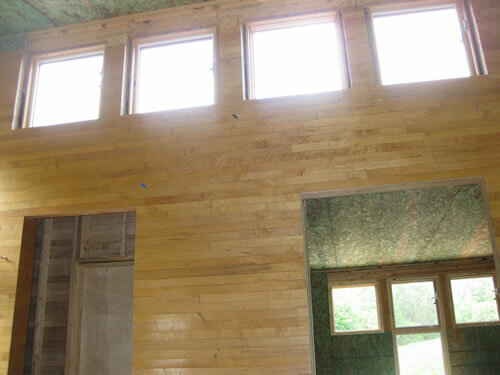 Here at the bottom of this rambling-as-usual post you will find alternatives to drywall for finishing the interior of an energy efficient SIP home. 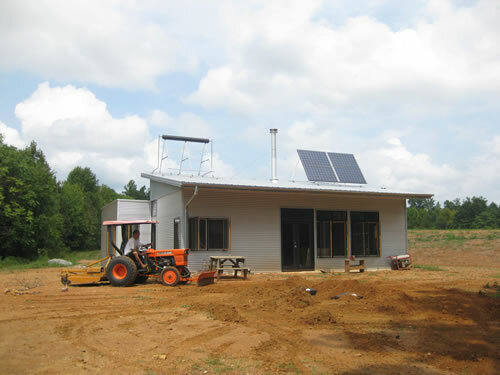 Usually I start these passive solar prefab house kit construction posts with what we worked on, then get personal. But this week, Handsome Hubby was in New York alllllllllllllllll week long for business, while I managed prefab home companies, co-ran a fantastic Green Drinks at Tricycle Gardens, worked on already-existing deadlines and interviewed new employees... all while working with children. On Friday, mid-afternoon, Handsome Husband returned, and we headed to the land. 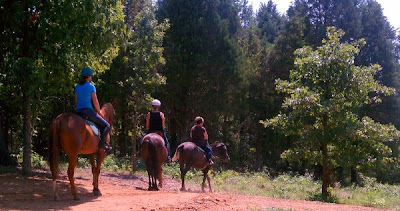 We were all exhausted, and I, not just exhausted, but something even further- spent. 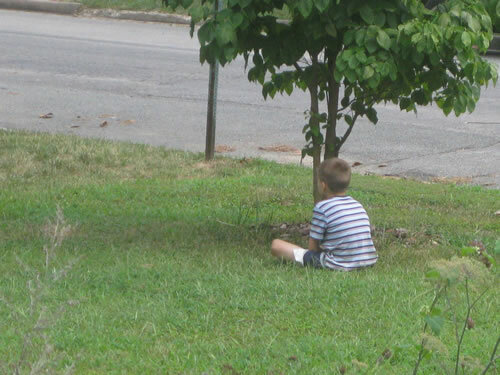 In the city, one child stalks the neighbors who took his hens this spring. I thought about discouraging him, but in the end, didn't. It's his thing. He has, even at this young age, that right, and I honestly admire his chutzpah. Not one adult in our neighborhood has the pleasant determination he does to stand up and have a discussion on an issue. He stays on our property, he is respectful, but he does confront them over their taking away his hens at any opportunity that presents itself. 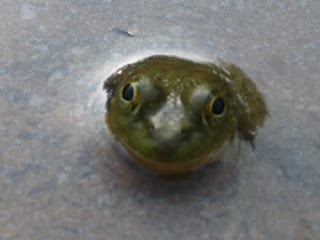 Any time they come out (which is extremely rare), he waits, and waits, and smiles, and follows, to engage them. They quickly mow their lawn, avoiding his facing eyes. "WHY DON'T YOU LIKE CHICKENS?!?" he implores, every time he sees them. Smugly, as their lips disappear into a tight line, they assert, "It's not that we don't like chickens, little boy, it's because it's against the law." They don't even have actual complaints against hens. Richmond, rectify this for your citizens; stand with liveable cities. Show us you are sustainable. And neighbors : In a community that has lost it's will to judge, I say: Bring it. Judge who is right, who is wrong, *settle* it. Refusal to take accountability is one more reason our civilization declines. 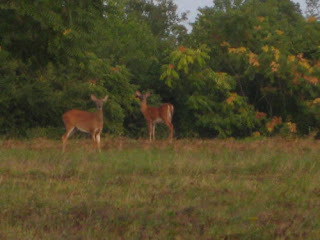 The tiptoeing of our west end neighborhood... geez. In the East Village of New York, in Richmond's Northside, in The Fan... people would have told us, and the Vanderspiegels, their opinion. Not: "Oh, we don't want to get involved." This involves all of us, because these people took our food away. This IS a community issue, that is, if this place were ever a true community. Which it's not. At all. So: We run to the land. Where people laugh openly at our Chicken Saga. 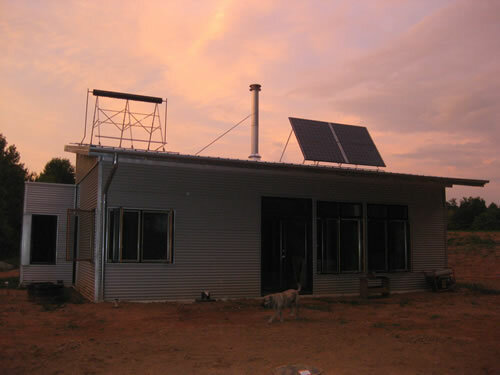 Recovering from the week, I hung back from doing the usual rounds once we arrived at the prefab home. Mrs. E sent back a huge bouquet of coxcombs home with the children. They happily chirped her instructions: "Hang them upside down!" 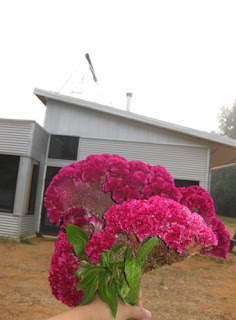 I will, after first admiring them a few days as a bouquet, and am so thrilled to reuse those seeds next spring. [I wonder if I had told her I wanted to plant amaranth on the field? I will have to ask her next weekend.] Regardless, it truly made my day, and reminded me of all the great, dear friends and strong community we have here. 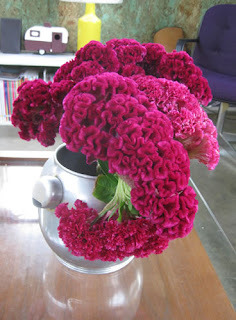 These flowers gave me more joy than you will ever know. Little did I know how the day would improve, even further. My children, in unison: "WHO's KERMIT?" When I returned home from a great ride, the Pipsqueaks were making "A Campground Entertainment Area" which they implored me to try. "THIS is the campfire area! THIS is the You Can Roll In The Tube area! THIS is the star watching area! THIS is the Watch The Frogs Area! THIS is the shooting area!!! COME AND SEE THE SHOW! 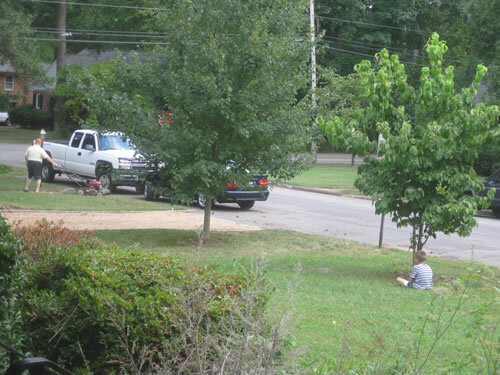 YOU CAN WORK OUTSIDE!" Gracious. I am on my way! As dusk waned we leaned back to stare at the stars. Here, everyone is busy and blossoms. Camp Manakin descendants, they certainly are. I was very sorry to miss Pamplin's Old Time Dance. The children have not yet been and I know they will love the music and people. 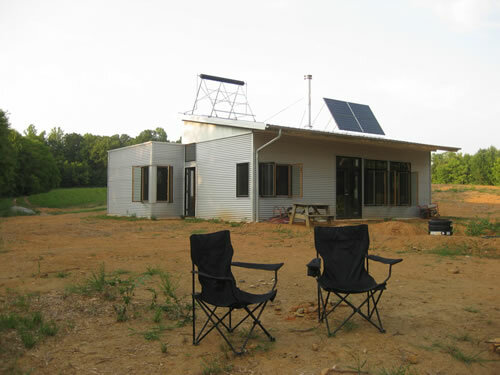 We can *SKYPE* at the off grid passive solar prefab! 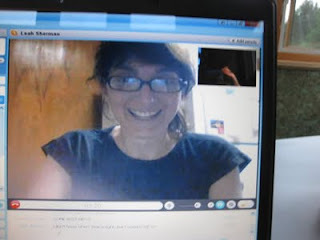 But one of my best, best, best friends-who-is-like-a-sister called, thus initiating the first skype video call to us while in the middle of nowhere, at the off grid, prefab house! Oh, we talked, and had to type when the connection faded, jarring our video image... Doctor L. is a naturopath finishing her residency in a cancer hospital outside of Chicago... I miss her so, and hearing her voice and seeing her smiling on my computer screen while I was here, off grid, in the prefab house while children danced about, dogs bayed, and Handsome Husbands did Husband Stuff on projects in the chaos... that the skype still worked... it was pure love. With laughter, and seriousness...I just felt so... filled. Restored. Happy to leave Richmond's unsustainability behind. For a moment. Now ready to go back to the sustainability fight. 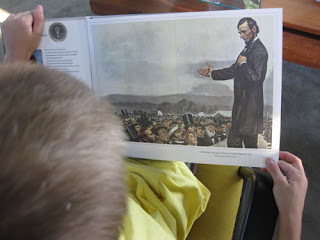 Once night fell, Pipsqueak #1 finally picked up something from the history books I had at the ready in the bookshelves - a 1960s series, The Golden Book : History Of The United States. As I type, he is still up, in bed, reading. I just don't want these moments to end. soon to be readied for fall. 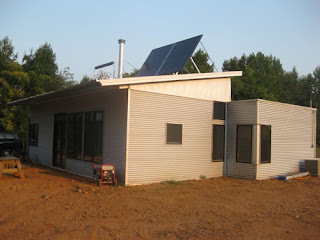 Already, the nights are getting cooler, and I think about what needs to get done in this prefab home before winter hits: Finish installing solar heat, connect the ERV to the outside, varnish interior doors, create access for the wireless connection that is not just through a cracked window... and unrealistically? Finishing off the interior of the SIP. Thoughts of a pot o' beans and soup simmering on the wood cook stove in this cozy off grid passive solar prefab home. Snow? Bring it. 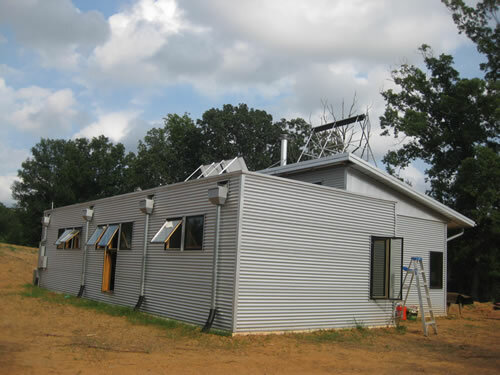 By then we'll have the solar heat tubes installed, the floors will be warm with radiant heat, and I'll have bubblin' hot food at the ready to warm you all up. It must have been contagious, because suddenly last week, the children begged me to make brown beans, despite the heat. So I did, with summer's hush puppies. I'm picturing all kinds of breads this winter to sop up that bean juice, filling cold childrenz bellies with warm cookstove goodness. I considered making cornbread but after listening to this I'm glad I didn't - too much excitement for one night! I wondered: How the heck did molasses ever fade from the average pantry shelf?!? Ahhhhhh, molasses. Y'know molasses: The bottle that reads "MO-LASSES" and that's the only ingredient?!? Reading about wooden food (the many brands that do not hesitate to add wood pulp to your "food"), I was bemused even Log Cabin Syrup has cellulose in it. My step quickens a pace towards fall as I think of all the hot dishes with comforting molasses to warm cold bones. From gingerbread snaps to Boston Beans, crisp cold air is comforting with the promise of 'lasses. "Minimize the use of drywall ...Drywall is really a paper faced wall with a hairy surface that collects dust and mould; glass and laminate clean up easily." There are environmentally friendly drywall products, but they act the same as drywall with the detractions noted, above. 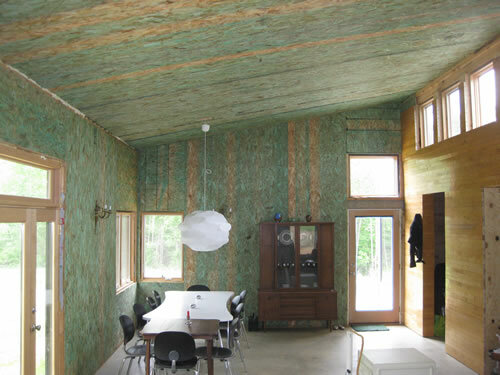 For ourselves, we opted for reusing and recycling the VMI basketball court on most walls, and, where appropriate, to use plywood on the uncovered structural insulated panels (SIPs) of the house kit. Apply "SIPs Stew" - but our experiments didn't end up so well. 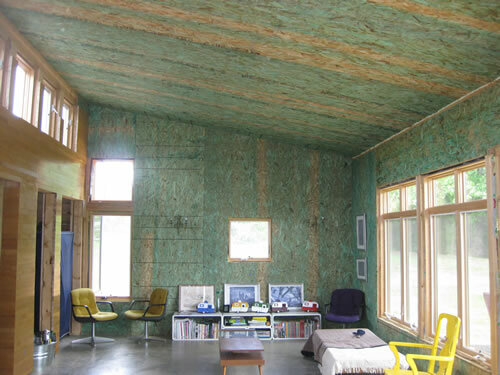 Just get over the roughness of the OSB and seal it (also appealing to me, I now know it doesn't bother me aesthetically but... oh, that green... ; ) ... I guess you could paint it first) but... would that be ok with local code? 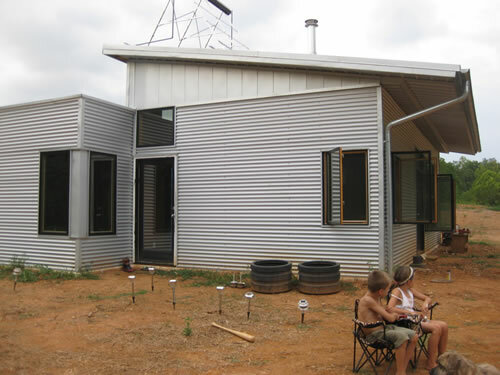 How would you / will you finish your own prefab house kit interior? 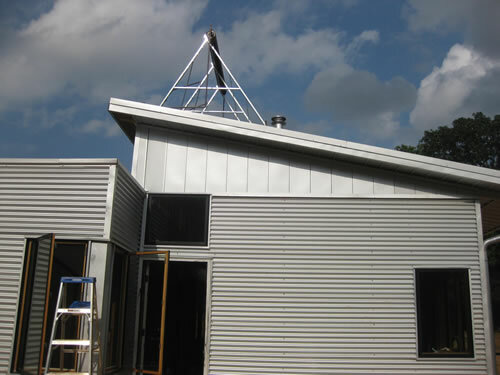 "Super Therm® is a ceramic based, water-borne, insulating coating, designed to block heat load, moisture penetration, and air infiltration over a surface and to reduce energy costs. Super Therm® is the most effective and longest lasting ceramic insulation coating on the market today. Super Therm® reflects over 95% of the three radiation sources from the sun, which are ultraviolet, visual light and infra red rays. Insulation Equivalent Rating - Super Therm® reflects over 95% of radiation from the sun replacing the 6 to 8 inches of traditional insulation to block initial heat load. 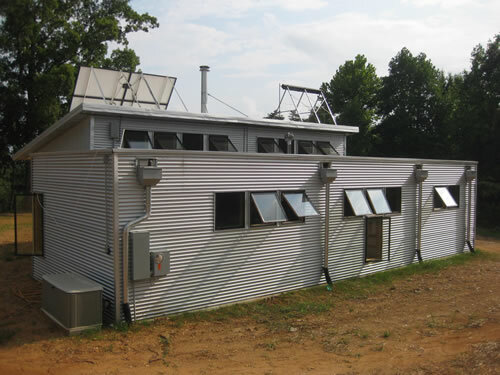 Certifications and Documentation Listing PDF"
Super Therm retails for about $100 per gallon. It's expensive but I like its merit. 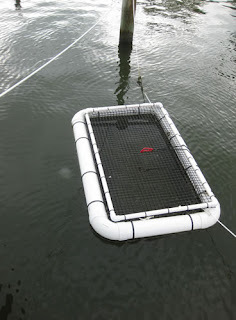 A gallon covers about 100 sf, and you can get it in 1 or 5 gallon pails. We had our first APPLE HARVEST here at Higher Ground! 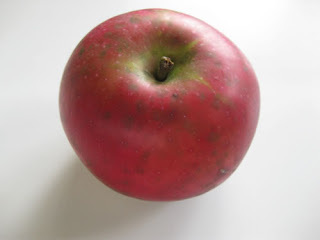 This apple was promptly turned into Apple Pancakes. But that's not to say I'll not have a few last Hurrahs To Summer before we succumb to fall. Ran To The Bay To Avoid Drywall. A Prefab House Kit Hiatus. 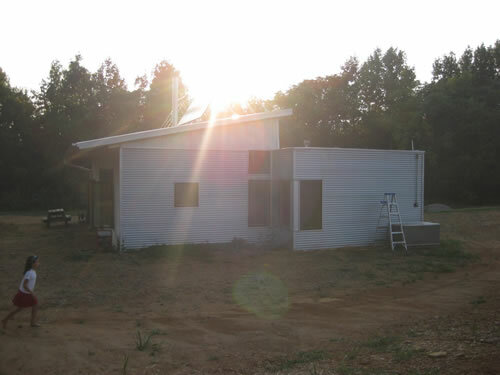 We did NOT go paint and hang drywall and work ourselves to death on the passive solar prefab home this weekend. I'm desperately trying to get in a lil' summer before more fall work on the prefab home sets in. 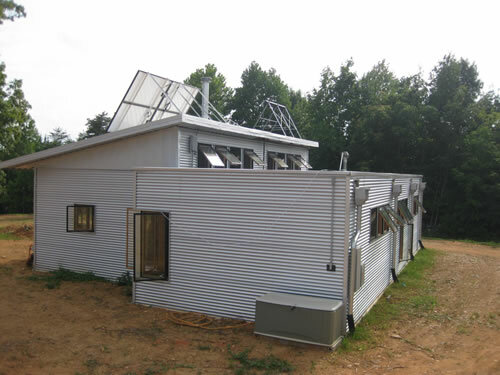 For three years I have tried to come up with an easier, better, affordable alternative to drywall for the passive solar zero prefab house (hello reclaimed VMI basketball court reused on the walls! But I don't want *all* the walls to be recycled maple...! The passive prefab would look like a sauna!)... and I haven't found a great, easy solution. And I am picturing a fall filled with drywall mess. So instead, we ran to the bay and made lots and lots of food. Not exactly the architectural solution you were hoping for, eh? At the market, we purchased three pounds of perfectly ripe plums. Then, Handsome Husband made Pflaumenpfannkuchen, and served it for lunch. Make the batter with milk, eggs flour, sugar and a pinch of salt. Slice the plums. Heat a pan to medium low, melt the bacon grease and pour in the batter. 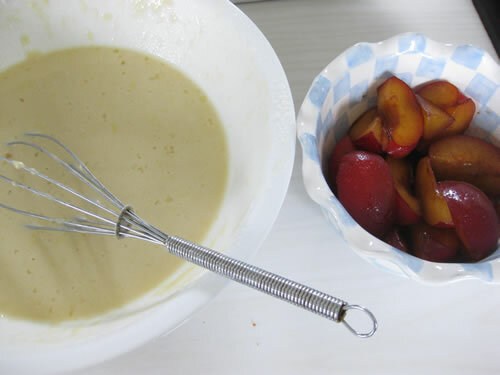 Place the plums onto the batter, cover and wait until the pancake is done. Flip the pancake and continue frying. 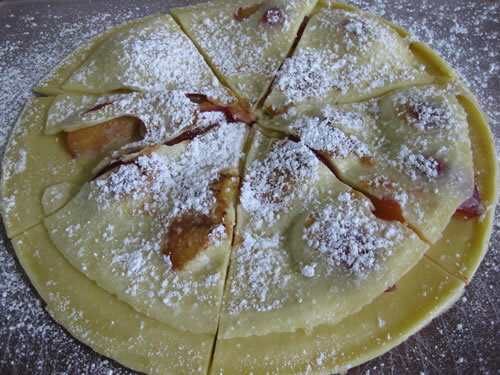 Sprinkle with confectioner's sugar and serve. The childrenz ran wild, digging in the sand and wading and splashing and swimming out into always deeper water, playing "We are dolphins and Artic otters!" 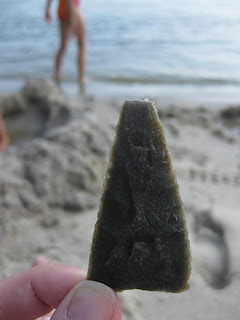 The 7yr old found a spearhead. 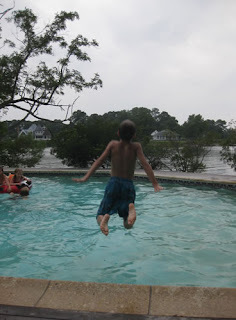 There was a cannonball competition. Little girls decided they would "train" The Junkyard Dog. He was very willing to play along. 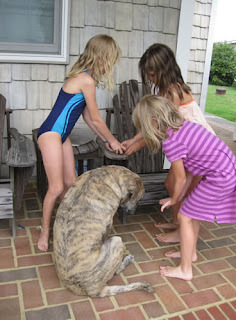 And ate like a King, hand fed by his adoring subjects. AND we made Kristen H's Jalapeno Poppers and my Homemade Hummus. Set oven to 350 Halve then scrape out innerds, then lay jalepeno peppers on a cookie sheet, making sure to leave in a few seeds. (I usually leave in 4-6, scattered evenly over jalepeno.) 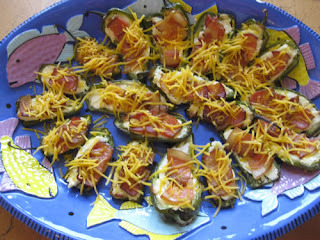 With a knife, cut strips of cream cheese to then lay within the halved jalepenos. Top jalepenos with sliced uncooked bacon Bake until bacon is crisp, I often set it at 350 for 1/2 hr then raise to 400 for 1/2 hr. Pull from oven & top with shredded cheddar. Yum. 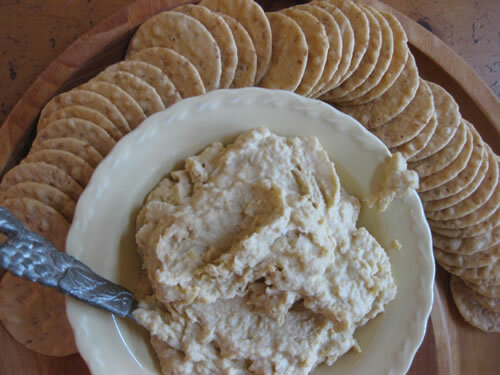 Blend in a food processor, let sit awhile, then serve with all kinds of sides and pita / crackers. 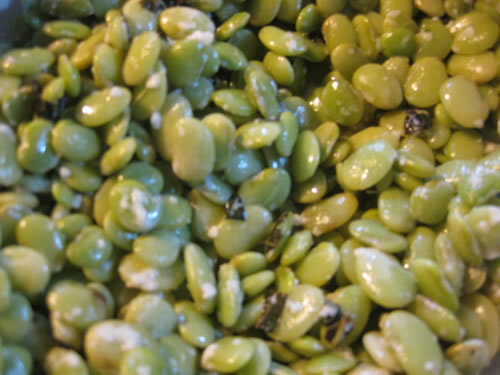 Boil butterbeans, about 8 minutes. Drain. Stir it up with tasty grease from the fridge (or butter if you don't have grease, but I you have to ask, WHY DON'T YOU HAVE GREASE?!? Only vegetarians are allowed to not utilize this ingredient from leftover yumminess! 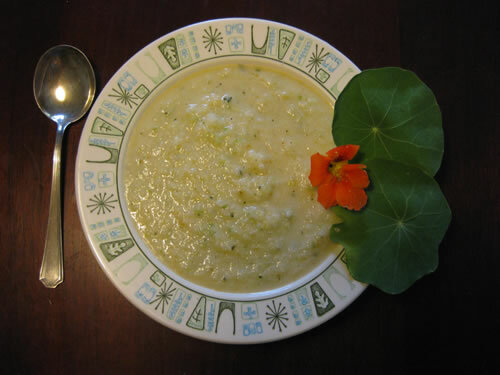 ), toss in some buttermilk, parmesean, salt & pepper and finally, fresh chopped mint. If you don't have buttermilk try a tad cream / butter. At night, the children watched movies. The adults had other adults over for cocktails and really good food. I sat on the end of the dock with Mrs. H and talked late into the evening... I noticed, in the dark, that the ducklings I had discovered when they hatched on Day 1 in the reeds weeks ago are now growing big and roosting on the oyster beds at night. What a *perfect* place to roost, protected from predators below by the oyster bed, and, surrounded by water, those that might eat them on land! Back in Richmond, I'm still avoiding drywall. The 8yr old has his own concerns: "I know it's a little early, but I'm worried I might not pass my driver's license test." "Why, because you can't follow directions?" "No, because there might be a bee in the cockpit." "I'd work on the following directions part more if I were you, buddy..."
Suddenly, again, I'm aware that fall nears, there's work to do, school will start, and another season turns as we slowly finish the passive solar zero energy off grid prefab house kit. But I'm already planning the next "to do's" for next weekend. Will drywall be one of them? Prefab Green Home : Relaxing Passive Solar Home Where The Heat Wave Breaks and I Don't Want To Let Summer Go. Finally, the heat wave breaks. 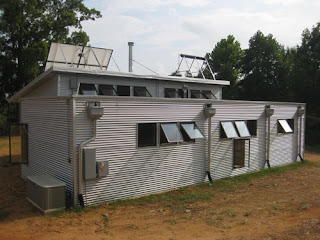 We headed out to the passive solar prefab. 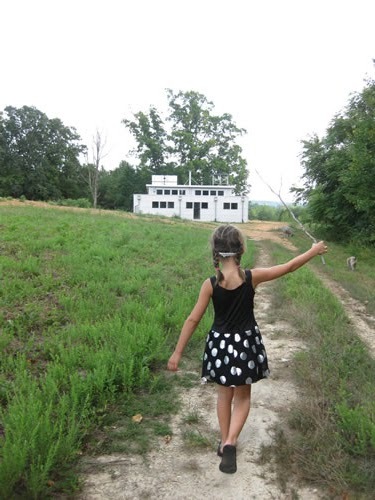 So y'all start buying a bunch more prefab house kits so I can go out and preserve all this rural architecture, 'K? ; ) But seriously, I do hate seeing beautiful structures forgotten and left to rot. "Y'all'd better skedaddle faster than that, November is just around the corner!" No really, it is. My mind is already on the approaching months and what I need to do before winter: paint window frames, doors, finish all electric, build shelves/organize, install solar heat tubes, start covering up the SIP on the inside of the prefab home. 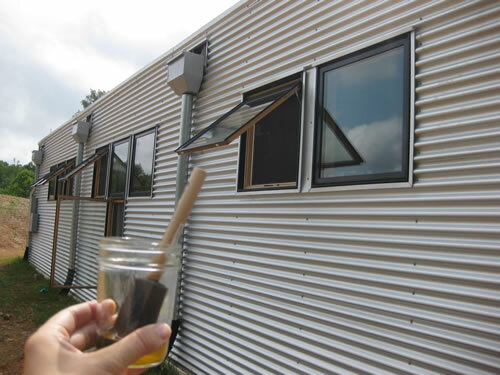 I will spare you the minutae details of our weekend spent painting the window frames. I tried to channel Tom Sawyer but there was no one to rope into my scheme. Resigned, I continued to paint. It's varnish, so you won't even be able to see a difference. So no big systems or interior design news in the passive solar prefab this week; yet we worked all weekend protecting our hard work and investment, preparing for winter, for rain, continuing to slowly work towards our future here. We had planned to visit our friends at Sans Soucy Vineyards as they rocked out with Hugh Vaughan tonight -- but here it is, 8:15, and we're still cleaning. So on the player we listen instead to Sally sing, the thunder roll, a gentle rain pitter patter, and the katydids hum as the light dies down slowly, fades, and fireflies emerge. Sweat still on our brow, we sigh as the heat lightning begins its show down across the valley: Perfect. Suddenly, like a horse that kicks and rears, taking off across the field- I have to get myself into this summer before it ends, another season gone, without me. I will play more hooky on the James. Stir it all up and pour over some local beef ribs and let marinate until ready to slow cook. Mmmmmmmm. Shred that mess up and voila! BBQ. I will do more history and art stuff. Toss with kosher salt, good olive oil, lemon juice or a vinegar, pepper, Parmesan (do not be shy with that Parmesan, folks.)... 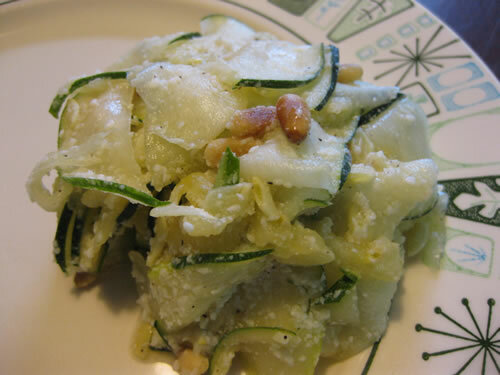 this time I did *not* use oil or vinegar, but tossed, just with s&p, Parmesan and toasted pine nuts. You could also throw in some of the following: toasted nuts (pine nuts! ), fresh basil, fresh oregano, fresh marjoram, Kalamata olives, feta... why not? Drain all liquid before serving. Here's another great take on raw zucchini salad- this time tossed with lentils, vinegar, mint & ham. I will drink lots of cold soups. seed, dice a bunch o' raw cucumbers to make up 1/2 - 3/5 of the entire recipe. salt & pepper & minced hot peppers - I used jalapeno. fresh mint. Not enough to make it overwhelm, but enough to sense it. I had a few cups of yogurt I had made last week with homemade peach jam stirred in... I threw that in. 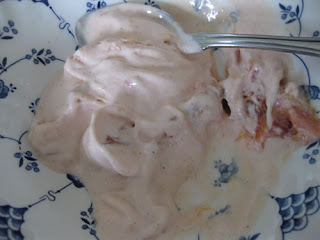 You know, that homemade peach yogurt- well, don't forget to add the peach, it really made it, with the fresh mint, the tangy yogurt, the subtle heat of the peppers & onion. You could throw in some buttermilk IF you're making large batches. Otherwise you don't need it. Puree, cool in fridge. Garnish with a mint leaf or nasturtium flower, vs. shreds of mint because you really do want it as a garnish and not to overwhelm the soup. 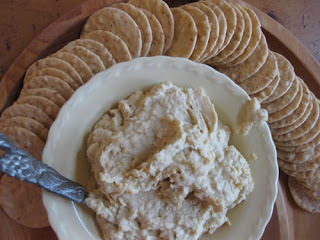 This would go great with fresh bread toasted then slathered with goat cheese. And with a steak. Before fall sets in, HERE I COME, SUMMER, throwing down deadlines and running towards you. The heat, the sweat, the time ticking slowly on placid heavy afternoons... BRING IT.